Filing corporate tax returns is one of the most important legal requirements of running a company. Enterprises hire accountants and other qualified professionals for corporate tax planning which helps them save money while ensuring compliance with all regulations. Taxation is a complex issue and no matter how diligently an organization works towards fulfilling its obligations, there are situations which require a relook or correction. Filing an amended tax return is one such which all companies want to avoid but is necessitated by some factors. Let’s take a look at the major reasons which force companies to file an amended tax return. Corporations engage professional accountants to prepare the documents for completing their taxation formalities but even then some mistakes happen which forces them to file an amended tax return. A mistake can occur due to many reasons ranging from a malfunctioning computer system to human error. Tax authorities in most jurisdictions provide a facility for correcting an already filed return within a fixed time period so that the mistake does not prove to be costly for the taxpayer. Companies must immediately start the process for rectifying the mistake as soon as it is spotted not only to claim refunds but also to avoid any possible penalties. Another common reason that forces commercial organizations to file returns again is realizing that they missed availing a tax benefit in the original returns. In many cases, accountants discover on analyzing the financial records after filing that they missed mentioning a valid deduction. Enterprises also take advantage of the review process when a tax break is announced after the completion of the process. They opt for refiling to claim the benefit. The reverse case scenario is also possible where the entity claims a benefit which it was not entitled to and in such instances, the revision procedure comes to their aid. It is not always the taxpayer which is at fault and sometimes the review is required because of changes made in the rules by the relevant authorities. Taxation is a complex matter and governments are always carrying out some modifications to the rules and regulations. A rule change or a judgment by a court of law which forces a change in applicable rates or laws can also be a factor for revision. Companies are on the lookout for such announcements which may affect them favourably. The review process enables them to take advantage of the new relief measures. 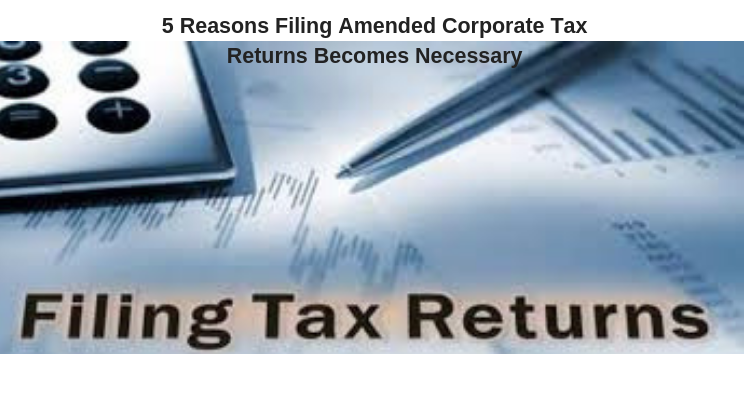 Filing corporate tax returns requires diligence on the part of the taxpayer and details about all transactions as well as investments must be included. Capital gains earned from the sale of an asset if eligible for taxes must be mentioned. Similarly, an investment like securities which has depreciated in value will qualify for capital losses. Both the facts must be a part of the returns and if they have been omitted, the review process helps in rectifying the mistake. This is helpful in claiming a rightful benefit as well as avoiding penalties. New information which affects the tax liabilities of a company may come up after the deadline for filing returns has passed. A deal which is finalized after the completion of the process or new data related to the financial position of the company is discovered which needs to be mentioned in the returns for the specified time period. In such circumstances, the facility of revision comes to their rescue and they can include the new information in the amended returns. Enterprises must be extremely careful while filing corporate tax returns as a mistake committed during the process may cost them dearly. They must engage professionals with extensive knowledge of tax laws and procedures to avoid such possibilities.